Where do you get your market research information online? A recent discussion question in The Market Research Event LinkedIn Group asked over 2,000 market research professionals where they get their market research information online. Click here to visit the complete list, and to add your own market research resources, join our The Market Research Event LinkedIn Group! Businesswire.com reports that the results of the ‘Uncle Sam at Your Service: 2010 Federal Customer Experience Study,’ which examined American citizens’ expectations and perceptions of U.S. Federal agencies’ customer service. Whether through Federal student aid, tax processing, disaster relief, or even airport security ‘ U.S. Federal agencies offer services to 307 million Americans every day. Gmail users rejoice! Thanks to the nifty roll-out of “Priority Inbox” by Gmail, fighting spam has never been easier. We know that Google has rolled out some pretty advanced spam filters; but they’ve never filtered out the bulk of newsletters, store promotions and Aunt Irma’s forwards like they have today. With just a few simple tweaks, you’ll be able to customize your inbox to suit whatever it is that’s most important to you in Gmail. Where this news is pretty amazing; Farhad Manjoo at Slate offers a bit of a reality check. Still, Priority Inbox is a work in progress’even after you train it for weeks to capture important messages, it’s not going to be perfect. Technically, sussing out valuable mail is a very different kind of problem from fighting spam. Spam-hunting benefits greatly from crowdsourcing’when millions of Yahoo or Gmail users flag a message as spam, it (and messages like it) gets filtered out for everyone. But the crowd doesn’t have much to say about what messages you are likely to find interesting; these are more personal decisions, and they’ll require more creative approaches by software engineers. Gmail has made a great start in this effort, but I hope Priority Mail gets competition from Microsoft, Yahoo, and other e-mail companies. We’re all going to keep getting more e-mail, and we’re going to need all the help we can get. How does your work culture affect the success and aid the growth of the employees in your company? I recently came across this presentation. Do you think that having a corporate culture like this one? We’ve seen NetFlix continually innovate and change the way we watch movies in our home. How much of an effect do you think the culture has on the success of a company? Even if you’ve been religiously checking in to Times Square, Foursquare has a gigantic reminder to do so. The social networking site squared off with other ads by displaying, “‘Check in, find your friends, unlock your city,’ which, according to TechCrunch is the largest digital billboard in Times Square. Will you be checking in soon? The ad is up against a myriad of visual stimuli and it just may stand out. We wonder if tourists will take note and help spread Foursquare’s presence back home? What do you think of the digital billboard? Lewis starts off her presentation by mentioning that P&G has done a lot of work on trying to get natural ingredients products on shelves. P&G has spent a lot of time to figure out what products would be beneficial for consumers and what really matters to them in different countries. Because of this P&G has created products such as the natural ingredients in dog and cat food which has saved many animals with enzyme problems just to name one. Consumer and market knowledge helps drive company strategy, innovation, and competitive advantage. This has sparked P&G to hold over 15,000 research studies per year and spends over $350 million each year on consumer research. P&G also spends a lot of time connecting with consumers across 80 countries and has about 5 million consumers with whom they do resaerch. Joan Lewis gives us an example of a case study with Pampers and UNICEF. Moms and dads want to help infants around the world but feel like they are helpless. Realizing this, Pampers launched the ’1 pack = 1 vaccine’ campaign where tetanus vaccines are giving to underprivileged children around the world. The purpose of the campaign is to eradicate the disease by 2015. The 2nd case study is about Olay Pro-X. A pretty large contingent of women are interested in skincare, they are interested to spend money and time on research, and are interested in products that actually work. P&G was faced with the challenge of make it shine in order to convey their benefits of working better than $350 priced prescription medications. The packaging of Pro-X and the work done before the product hit shelves added to its credibility at $40-$50 an item. Even though there was skepticism of the product, it has been the largest launch in Olay history. Olay was able to provide consumers with a product that is valuable to them. The 3rd case study is about Secret Clinical Strength. There was a small group of women who struggled with heavy sweating and a team listened to their problems. These women had a need that P&G could help improve on and deliver a valuable product to them. P&G had the challenge of creating a great quality product and delivering messaging to reach this target. The product has won many product awards and has received many accolades which have made it a huge success in store shelves. We all heard about the recent stories involving the JetBlue flight attendant and the outpouring of empathy toward his actions. As usual, JetBlue was very quick to address the situation- which is what customers have come to expect from the company, which was ranked ‘Highest in Customer Satisfaction Among Low-Cost Carriers in North America’ by J.D. Power and Associates just two months ago. In light of this incident, we are pleased to announce the newest speaker addition to the NACCM 2010 agenda, Vicky Stennes, Vice President, In-Flight Customer Experience, JetBlue Airways. JetBlue obviously invests in their customers- Now is the time to invest in yours. It all starts at NACCM. Gain access to the 2009 Executive Summaries from NACCM, Customer UNinterrupted and Linkage Strategies. Opt-in here with your contact information and we’ll provide you with the key learnings from 2009 that you can present to management. Consider these AVERAGE costs (and consider these departmental budgets an alternative place to fund your conference investment). NACCM is actually a great cost saver. See the average costs below and then you do the math. NACCM provides incredible business value for a fraction of the spend. Click here for more information on the special Loyalty & Social CRM Summit, dedicated entirely to helping you KEEP your exiting customers (with a special focus on the new ways they want to be communicated with online). NACCM unveils the latest research and showcases it through case studies on how to apply these findings for business REULTS. NACCM has become the recognized meeting place for the key players in specific segments to come together year after year. NACCM provides PRACTICAL executive education by focusing on real stories from true business leaders who have tackled issues head-on. Featuring over 70 sessions in just 3 days. PLUS – don’t miss a special training from the Disney Institute. View the full agenda here. NACCM is renowned for bringing together diversity…benchmark yourself across various criteria alongside competitors and industry leaders. View the cross-industry speaking roster. NACCM is the leading platform for sharing what works and what doesn’t. Learn from the failures and successes of others and save yourself, your team and your company resources, time and tears. Click here for more on keynote Joey Fitts’ presentation on “Drive Business Performance: How Leaders Enable a Culture of Intelligent Execution”. We hope to see you in Orlando this October. Mediapost.com reports that Minneapolis-based retailer, Target is set to expand it’s customer service electronics support. Consumers can call 1-877-myTGTtech, a free product support hotline for all Target electronics purchases, staffed with customer service reps who can help with troubleshooting, tech support, warranties, and compatibility questions. Target has also expanded its plans for its Target Mobile centers, a partnership it recently announced with Radio Shack that will put kiosks stocked with cell phones and accessories in 850 stores by year’s end. What do you think of Target’s increase in the electronics support space? We’d like to hear your thoughts. The New York Post recently looked at how TiVo is setting out to fully capture how the US public spends their time consuming television programs and other mediums. Using their settop boxes, they will monitor the amount of time tv viewers spend watching television, recorded programs, and other options available through the service such as YouTube and NetFlix. This puts them in high, direct competition with Neilson, who has traditionally tracked television viewership. How do you think this will affect the industry. Do you believe that marketers will benefit from knowing the exact viewing habits of their set top box owners? 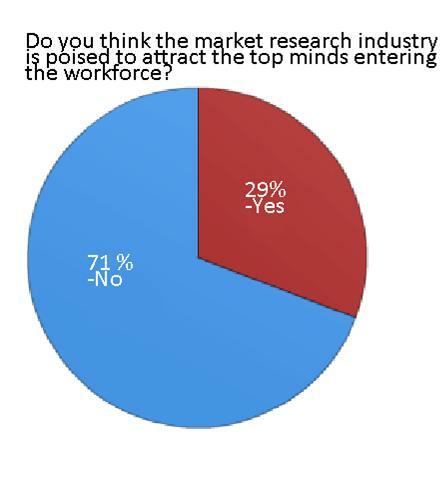 TMRE Poll Results: Do you think the market research industry is poised to attract the top minds entering the workforce? The second TMRE Poll closed this week, and you answered the question: Do you think the market research industry is poised to attract the top minds entering the workforce?